"Anyone with a phone now has the power to broadcast to anyone in the world. When you interact live, you feel connected in a more personal way." - Mark Zuckerberg, Founder and CEO, Facebook. I have to admit, when the idea of the IPO streaming live online was first raised, I was a little apprehensive. As a manager of the IPO’s social media accounts, I’m no stranger to sharing content and publicly responding to difficult questions. But this was something new, something different…this was live. I’d have no control over anything and that’s my worst nightmare! what platform would we use and would the technology work? 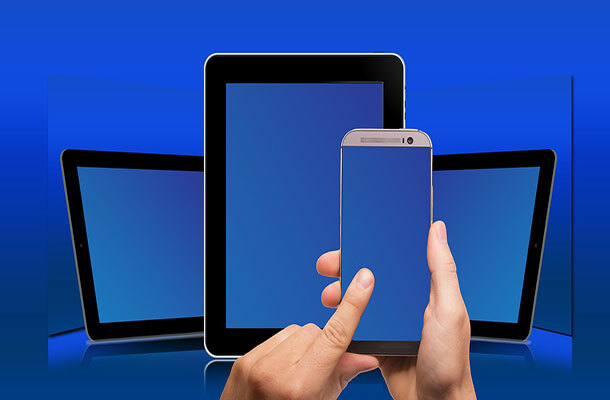 could we capture an online audience’s attention for 10-15mins? would we be ridiculed for trying something new? how would we manage the risks involved in live broadcasting? At 11am on Tuesday 19 July 2016, the IPO made its very first Facebook Live broadcast. If you don’t know what Facebook Live is, it’s simply a live video streamed through a Facebook status. With just a few taps, you can instantly share live video on your Facebook page and viewers can like, share or comment, all in real time. 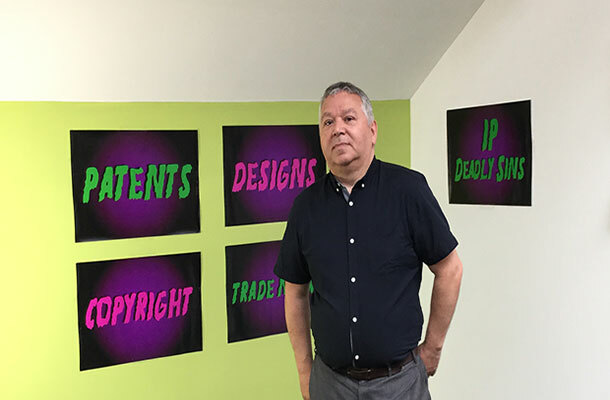 Regular blogger and Business Outreach team member Gary Townley took to the floor to present our first session on IP’s deadly sins. 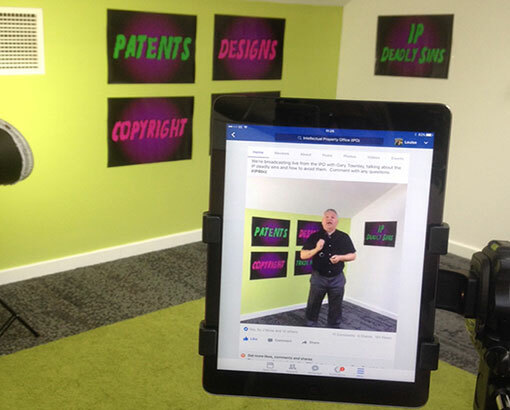 His plan was to highlight the common mistakes businesses make when dipping their toes into IP for the first time. Business Outreach Manager, Gary Townley. I’m sure I speak for the whole team when I say that pressing the ‘live’ button was one of the most nerve-wracking thing’s we’ve ever done! But that momentary fear was relieved as soon as the camera started rolling. Due to the earlier mentioned risks, we decided to keep promotion of the broadcast to a minimum. Under no illusions that we'd get ground-breaking viewing figures, just one viewer would have made it worthwhile. You can imagine our delight when we doubled that target within the first few seconds! Gary’s flawless delivery and the support of the IPO’s friends, partners and staff made all my early worries seem insignificant. As a first attempt, it’s not just about how well we did. What we’ve learnt and how we use this to improve future activities (online or otherwise) is more important. One of the biggest benefits is that we can reach a wide and varied audience. We had viewers from all over the UK (including Brighton, Derby and London) representing a variety of different industries and sectors. One person alone couldn’t normally achieve that on a Tuesday morning. What’s more, it’s relatively cheap to do. If hosted in-house and promoted via existing channels, a live session can be cost free. All it takes is a few hours of your time. Looking forward, what possibilities does live broadcasting hold? Could this 15 minute experiment be a small glimpse into the future of IPO outreach work? One exciting idea is to host joint broadcasts with our partners. We often work with Companies House or UKTI to deliver workshops and exhibit at events. Imagine having all these experts together, streaming live into your home/office and answering your questions. If you missed the live broadcast, or just fancy watching it again, you can still watch the video on our Facebook page. To keep up the momentum, we’ll be hosting our next session on Wednesday 24 August 2016 at 3pm. Emma Richards will be talking ‘IP for Business’ and showcasing the resources available to help you identify and protect your IP assets. If you liked, loathed or laughed at our first attempt, we want to hear about it. And if you’ve got any suggestions for future sessions, let us know at socialmedia@ipo.gov.uk. Whose name is it anyway?